The gluteus minimus, as its name suggests, is the smallest of the three gluteal muscles and lies beneath the other two muscles in the buttock region. This muscle shares almost identical functioning with the gluteus medius muscle, namely stabilizing the pelvis during walking or running and abducting the thigh when the leg is not weight bearing. 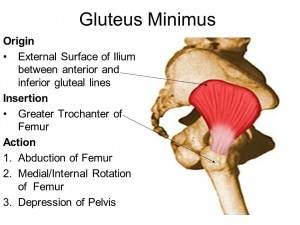 The gluteus minimus is one of the secondary muscles that can produce hip extension. This muscle is located deep and somewhat anterior to (in front of) the gluteus medius. It is a broad and triangular muscle. The gluteus minimus and gluteus medius are separated by deep branches of the superior gluteal neurovascular bundle, a group of nerves and blood vessels. The gluteus minimus emerges from the external surface of the ilium, part of the large pelvic bone, between the base and the front of the gluteal lines, bony ridges on the ilium that are used to mark the attachments of different gluteal muscles. It inserts into the greater trochanter of the femur, which is a bony prominence located at the top of the thigh bone, near the hip joint. Like the gluteus medius, the minimus has a fan-like (or radial) structure with two fiber divisions; the thicker and compact anterior fibers and the flatter, but more spread out, posterior fibers. Outer (external) surface of ilium, between the anterior and inferior gluteal lines. Anterior surface of the greater trochanter of femur. A bursa is interposed between the tendon and the greater trochanter. Between the gluteus medius and gluteus minimus are the deep branches of the superior gluteal vessels and the superior gluteal nerve (L5, S1). The deep surface of the gluteus minimus is in relation with the reflected tendon of the rectus femoris and the capsule of the hip joint. The following muscle groups share similar biomechanical functionality with the gluteus minimus muscle and may become overloaded if that muscle is unable to perform its workload due to trigger point activity or injury. The gluteus medius and minimus muscles are functionally (and sometimes anatomically) one muscle group, so to say they are synergists is an understatement. The tensor fascia latae muscle assists in both hip abduction and medial rotation. Clients with trigger point activity in the muscle group may report or demonstrate the following symptoms and clinical findings.